So as long as I also give myself time to write and take photos, I will still be spending time here with you all. Which is also very important. So many of you have been so wonderful – beyond wonderful – I received three cards in the mail in the last few days, and that just makes my day. Really, you guys are the best – your emails, phone calls, messages and tweets, they all mean so much. Did you all watch the Oscars? Our ‘party snacks’ for the Academy Awards included these Spicy Stuffed Sweet Peppers, stuffed with spicy goodness that is oh so close to my Noocho Cheese recipe. It was just Jason, Basil and I, a couch and some blankets. Slice tops from peppers, reserve for decorative ‘hats’. 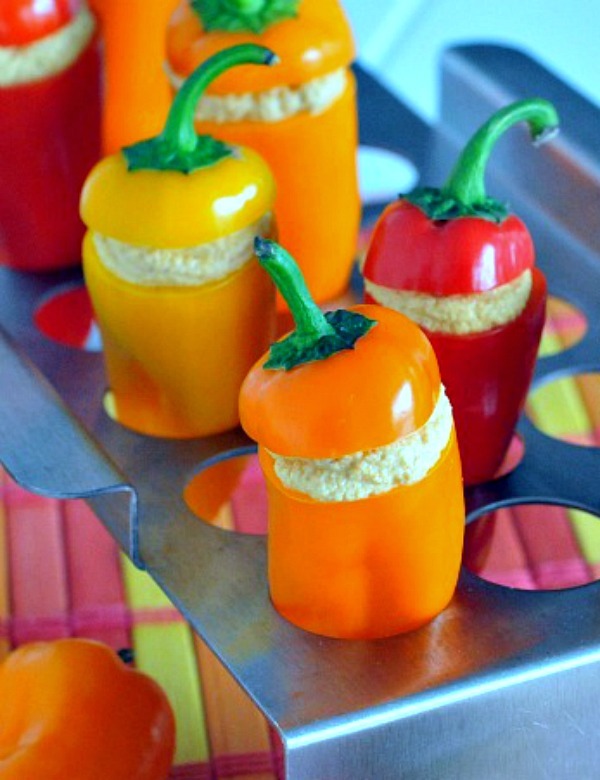 Remove any seeds, ribs – these sweet peppers do not have much. To make filling, begin with soaked cashews – in a food processor, process alone to an almost creamy consistency. Add lemon juice, Tabasco and a couple tablespoons of the water – continue processing until smooth. While processing, add garlic, nutritional yeast, paprika, chili and onion powders, stopping to scrape sides. Add remaining water as needed – end result consistency should be thick. Transfer to piping bag (plastic baggie), cut tip of baggie, fill each pepper. Top with stem hat, optional. I served these two ways: as is, crunchy cold raw peppers. Second batch was oven grilled at 350 for about 12 minutes. I used our jalapeno pepper roaster with a baking pan underneath. We love these both ways – the cold raw peppers are fresh and crunchy, the baked/grilled peppers are warm and the spicy flavor is intensified. I am buying another bag of these sweet peppers, and this time, I may just stuff them with goat cheese. I just really, really want some. I know Dad will love them, too. Slice tops from peppers, reserve for decorative 'hats'. Remove any seeds, ribs - these sweet peppers do not have much. – continue processing until smooth. While processing, add garlic, nutritional yeast, paprika, chili and onion powders, stopping to scrape sides. Add remaining water as needed - end result consistency should be thick.